The genus Serinus is a large genus of birds in the finch family Fringillidae found mostly in the Afrotropical region with some outlying species in Europe and Asia. The genus contains several species groups including canaries, citrils, seedeaters and the African siskins. The treatment of the Canary group as a single genus has been subject to much debate, with behavioural and vocal characters being used to divide it into seven or more genera. 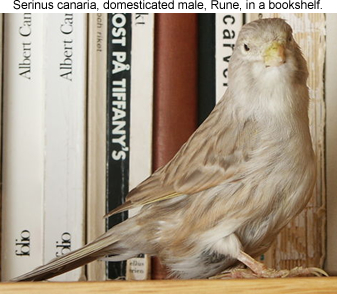 Recent investigations using part of the mitochondrial cytochrome b gene have suggested the genus consists of two main clades (Serinus sensu stricto and Crithagra) separated by certain members of the genus Carduelis, and these may be better treated as two separate genera. Species in the Crithagra clade could conceivably be split further into several more (sub)genera and may well be once relationships within the clade are better resolved. In the list below they are arranged in the groups as suggested in various publications e.g. (Elzen et al) and (Ryan et al). The majority of species are small to medium sized birds with green and yellow, often streaky plumage though there are a few notable exceptions.